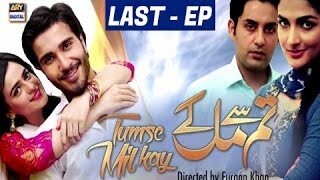 Tumse Mil Kay is a story about a beautiful girl who was left alone in this world, dreaming that one day a prince charming would come to rescue her from all her miseries. She patiently waits for the magic of destiny to spellbind the charm of love everywhere. This charm may not be everlasting because the fear of reality haunts her by every passing day.Every girl dreams about a prince charming who will be her soul mate for all the uncertainties of life� For a prince its sometimes difficult to find his princess and make everything according to her with his mesmerizing charm� Sometimes finding your love becomes complicated� Finding your dream lover sometimes remains a dream�Written by: Aneeza SyedDirected by: Furqan KhanCastSumbul IqbalFeroze KhanAffan WaheedRabab HashimFarah ShahTehreem ZubairiSaleem MairajSheheryar ZaidiSeemi Pasha and others.